Contract disputes appear frequently in small claims court. Many small businesspersons or consumers find themselves in small claims court eventually. 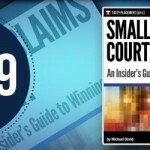 Let’s examine how to pursue and how to defend a contract dispute in small claims court. It’s important to separate contract disputes into two categories. First are contract disputes with a participating plaintiff, and a participating defendant. Second are simple collection matters. Collection matters are actually very common in small claims court. In a typical collection action, there is an active and participating plaintiff, but the defendant is not participating. The defendant in a collection action has no defense to the dispute, and almost never appears. Collection actions are simply a stepping stone by which a plaintiff advances an overdue bill to a court judgment. We’ll cover collection actions first because they are generally simpler, and then we’ll discuss contractual disputes. Then, we’ll talk briefly about collecting on loans, which are really a form of contract. As stated, a collection action is initiated by a plaintiff to collect an unpaid bill or invoice. You should think of collection matters more as a pursuit than as a struggle. From that perspective, they differ from regular contract disputes. The plaintiff’s goal in such an action is to advance the matter to a judgment. Once the plaintiff has a judgment, he or she (or it, because plaintiffs in collection actions are quite commonly business entities) can use the judgment to collect the debt through garnishment or levy. In a collection matter, the underlying legal theory is breach of contract. At its core, a collection action is simply one party to a contract seeking to enforce the other party’s performance. The collection plaintiff must keep this in mind; he or she must prove that a contract was made, that the plaintiff performed his or her end of the contract, and that the defendant did not pay or live up to his or her end of the contract. Collection actions are filed by parties ranging in size from enormous credit card companies to small mom-and-pop businesses. Before proceeding with a collection action, you should always attempt to collect the debt through demand letters and other collection techniques.
? That you (or your corporate, LLC, or partnership plaintiff) and the defendant entered into a contract. Contract cases are much easier for plaintiffs if a written contract signed by the defendant was made and is brought to court.
? That you, the plaintiff, performed your end of the bargain. Prove this with photographs or copies of work you did, or a delivery receipt, or a statement, or copies of invoices. Be prepared to buttress your documentary evidence with oral testimony to the effect that you held up your end of the bargain by performing on time, and in all other respects in accordance with the contract.
? That the defendant has not paid on the debt. Beyond that, you might suggest to the judge that the matter is simply a collections matter. If the defendant hasn’t responded to your demand letters and bills, point that out to the judge. You want to tell a story of an uninterested and non-participating defendant if you can. If you are lucky, the defendant won’t show up and you should easily win your case. If the defendant does show up, he or she will likely make some complaints about the quality of the work the plaintiff did; your collection matter may be a struggle after all.
? The plaintiff has to undertake a lot of work to collect the full amount of the debt. But the defendant must act early. Once the plaintiff has already gone through court, the plaintiff has done most of the work, and the defendant loses this advantage. Also, plaintiffs typically firm up their resolve to collect after they have been through the hassle of going to court.
? The plaintiff, even after he or she wins his or her case, still must collect the debt. Most ordinary folks don’t realize how hard it can be to collect on judgments. In fact, many small claims judgments go uncollected. In many cases, collecting on the judgment requires more work and expense than winning the judgment at the small claims court hearing! So, as a defendant in a collections matter, you need to act early, in the demand stage of the case. This is the stage where you have a shot at convincing the plaintiff to “compromise” the claim. You’ll need to be prepared to pay immediately when the claim is compromised. The plaintiff will only compromise the claim for fast money.